As you know, I switched Chester and Gretel’s diet to grain-free kibble last year. 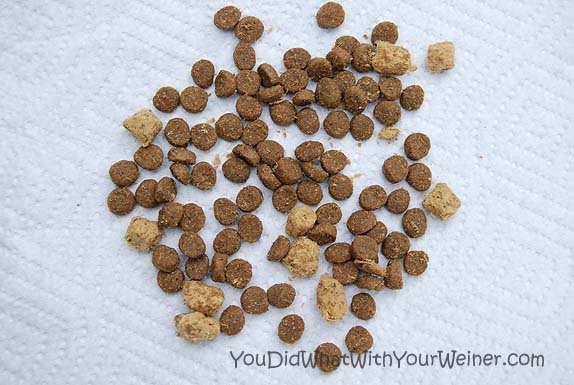 I include raw foods in their diet sometimes but still choose to primarily feed them kibble. There are many opinions around feeding your pet kibble or raw food. I agree that raw meat is mostly what wolves ate – from which domesticated dogs came from. There is some controversy over how domesticated dogs have or have not adapted to a more domesticated (aka. processed) diet. I do not believe that domesticated dogs MUST eat raw food to survive or be healthy. However, I am 100% sure that a dog thinks that eating raw food is tasty and, as with humans, less processed food is healthier. For me, feeding kibble comes down to the convenience factor. Yes, I have done my research and know what it does and doesn’t take to feed raw. Kibble just works best for our adventurous, one-the-go lifestyle. I don’t want their stomachs and taste buds to get used to not ever eating it so I feed them kibble on a regular basis. 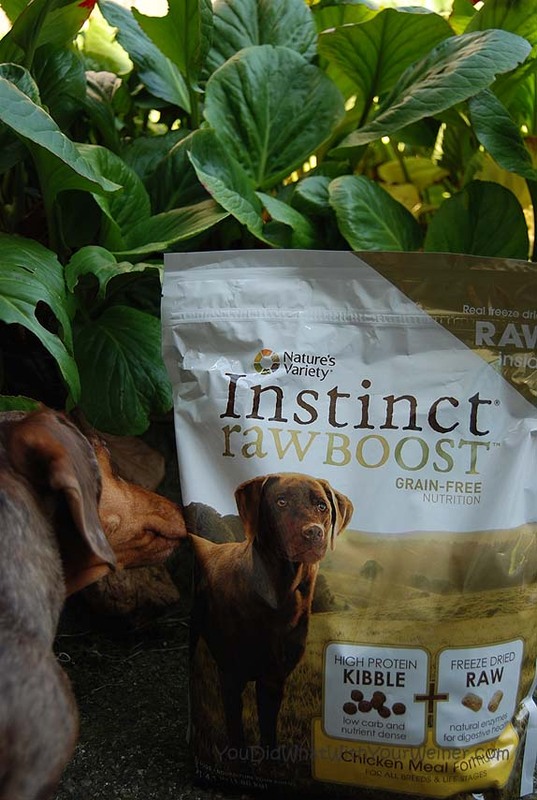 When I was contacted by Nature’s Variety to try out their new Instinct Raw Boost Grain-Free Kibble I was excited. The product is a traditional grain-free kibble mixed with bite-sized pieces of freeze dried raw food. It seemed like a great way to keep the convenience of kibble while getting some of the benefits of raw food. I wouldn’t have to change my routine at all. Chester and Gretel LOVED the raw bits. Part of me was afraid they would pick the good bits out and leave the rest but they didn’t. The price is comparable to other high-quality, grain-free kibbles on the market. There is 10% more protein (40%) and 4% more fat (22%) than in their regular food. Since dogs primarily get their energy and nutrients from these things I think more is better. There are 50 more kcal per cup (490). Chester and Gretel are still a very healthy weight and don’t eat much so I don’t think the extra calories will be significant. The bottom line is that I liked this food because of the Raw benefits. Chester and Gretel loved the taste. I hear it is good to rotate dog foods every once in a while to provide a variety of tastes and nutrients so I plan to include this food in our rotation in the future. Disclaimer: Nature’s Variety provided us a no-cost bag of food to try in exchange for our honest review. Our review policy does not guarantee and favorable review. I admit that I’m intrigued by this idea a lot. We are currently feeding food that I feel comfortable with, and we’ve learned that we have to be very careful with Kuster about how much protein he gets in his food. Too much leads to pano flare ups, from what we’ve been able to learn through reading and food trials with him. I have a feeling that this food would be very popular at our house! Nature’s Domain (grain free) from Costco. I have a friend who raises Pit Bulls and that is what she feeds too. She might go for something higher quality but with 8 big dogs to feed it is good for the price. The Professor eats merrick’s grain free food. I might try the Instinct since the Professor loves those freeze dried bits. Thanks for the tip Sugar! I’m glad to see this post. I spoke with the company rep at my local Pet Supermarket after learning Merrick is reformulating their kibble and will no longer supply Pet Supermarket. Merrick’s rotation feeding option was great, allowing flavor variety without the usual lower gi switching effects. I’m hoping this brand serves the same purpose and is tasty to my picky eaters. I think I have heard of Merrick before. My blogger friend wrote a review about a brand of food that offered different flavors/formulations intended to be used on a rotational basis. It’s too bad they have discontinued it because it seemed like a good solution for pets with sensitive tummies. I bought a puzzle box for my two puppies; they need to push the slides open to get the food. For Ralph Waldo, I put raw treats and kibble in every other space; he ate them all without preference. For Diva, I put raw treats in all but one with kibble; she got to the kibble, left it, opened and finished the rest of the raw; she never went back to the kibble. Diva is a bit more discriminating than RW :). I can’t afford to do raw for 26 dogs but use it when have a real deal from my local pet products store. My gosh! I don’t think I realized that you have 26 dogs. I watched 4 Doxies for a few weeks so, including Chester and Gretel, there were 6 at my house. I can honestly say that I reached my limit…so kudos to you. We’re a tad skeptical about how much benefit a few bites of freeze dried would make, but we LOVE LOVE LOVE the idea that raw feeding and the ideas are becoming more mainstream. Raw isn’t for everyone, but products like this and other freeze dried or dehydrated raw (another option you might check out! )make it so much easier for people to try it and see how it affects their pets. I know Koly and Fe do so much better on raw, but I do miss the convenience of kibble for sure! Nola loves their freeze dried raw treats! They’re the perfect advanced trick training treat; high value, smelly and quickly eaten. My gang is on homemade food because of Nola’s allergies, but I like using some high quality kibble as treats during basic reinforcement training. I know the difficulties that you have had with Nola’s allergies. I am glad that you have made the effort to find what works for her. I am also very thankful that Chester and Gretel are very healthy and I have not had to deal with those kinds of issues. On the other hand, I could appreciate some first-hand experiences with those kinds of issues. You are missing a huge point when feeding a dry food. 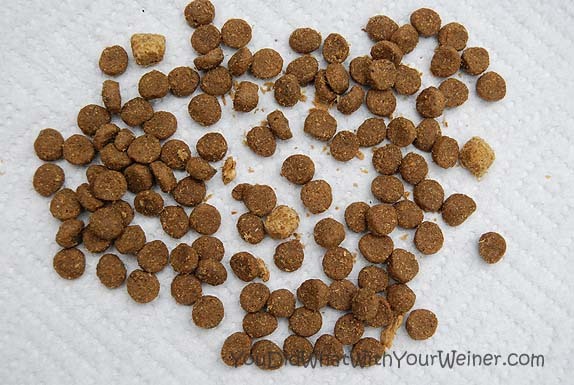 Dogs are not made to eat dry food and that is why so many dogs get kidney problems. Kibble, dehydrated, whatever, it’s not wet enough to be healthy. It is my belief that putting convenience ahead of a dog’s health is abuse. If you can’t feed food that is species appropriate then please don’t have that animal as a pet. No, raw isn’t for everyone but it is the only food appropriate for carnivores. I wouldn’t own a lion if I could not feed it right. For way too long we have thought it ok to feed dogs just about anything but what they should have to eat. It’s time to wake up and stop using excuses for feeding them crap in a bag. There are many people out there who feed raw and have for decades and don’t think it is inconvenient. I understand your opinion and how passionate you are about it. Your previous comments have made that very clear. I can respect your opinion and I know you are not the only person who believes that feeding their dog raw food is the only appropriate thing to do. I can only say that I agree to disagree. In my opinion, it is not abusive to feed your pet a commercially available food. Almost 100% of dog owners (and owners of all types of pets for that matter – including breeders) feed their pets commercially available food. I don’t agree that all of those people are abusing their dogs and pets and should not own one. Everyone is entitled to their opinion and I do not believe that just because someone doesn’t believe like I do that they are wrong. That is just me though and I can appreciate that some people are so passionate about their beliefs that they won’t accept anything less. Your 100% figure would not apply outside of the United States. In other places in the world kibble is not the norm. You personally know much more about feeding than your average person so you have a higher standard to live by and to feed by. Most people have no idea there are other ways to feed their pets and because of that can’t be held responsible since they are doing the best they know. You on the other hand do know better but evidently not well enough or you’d not still think that dry food is ok.
Kibble causes dogs to be sick. Periodontal disease, constant yeast infections, diabetes, kidney failure, so much more, all due to feeding a dry food high in carbohydrates. Dogs have no requirement for carbs. I understand what you are saying – that feeding kibble can lead to health problems. It can also not cause health problems. I think only an owner can decide by observation if it is not agreeing with their dog. I do not believe feeding kibble is an automatic death sentence but I, too, wish people who are having issues knew what the alternatives werre. I have heard of people seeing amazing results. We have gone from feeding regular kibble to feeding higher quality kibble to feeding grain free to feeding primarily raw. I have not seen a difference in health. They have always been super healthy. Cigarettes aren’t an automatic death sentence either so with your thinking, you’d let your teenage kids smoke. Why is it you didn’t allow responses to your post? And if you haven’t seen a difference in health, as time goes on you will see a difference in what you spend at the vet’s office. I have spent absolutely nothing in many years. Of course, that takes more than a change in diet. It also takes into consideration that I don’t vaccinate anymore (in particular the rabies vaccine causes a lot of health issues like autoimmune diseases and cancer) and I stopped using harmful flea products and heart worm products. They aren’t “preventatives”, they are pesticides you put on and in your dogs. This is a link every pet owner should read! As is common practice with most blogs, comments are moderated in an effort to avoid Spam. You comment went into moderation and had to be approved by me before it would show in the comments section. This happens every time someone is a “new commenter”. New can mean that they are completely new or that they used different credentials (a different email for example) to sign in than they did with their previously approved comments. It could have also been a glitch of the moderation program. “Moderation” is controlled by the blogging platform program. A human, me, has the ability to approve those comments and make them visible. I am thinking that is what you meant by “don’t allow comments to show”. I clearly do allow them to show because I approved your comment and it is visible to everyone on the comment thread. I am not sure what your purpose is of being so adamant about they way I am feeding my dogs is wrong. I have plainly stated that you and I do not agree on this – on many levels – yet you continue to try and convince me. Am I missing something? What I meant is that there is no reply option so I can reply right to your post. I have to back up a few posts to add a reply. I’m going to assume you really misunderstood what I posted and weren’t turning it into something else. As for what you are missing, it’s called debate. You state a point, I give mine. Along with my points I provide factual evidence as to why I have this view in the form of links. You seem to have no facts to back up why you feed kibble when you know it causes harm, and you avoided my example of allowing your children (or future children) to smoke. Tell me why you feel feeding kibble is OK even though you know it can cause harm and tell me if you feel teens should smoke cigarettes even though you know it can cause harm. I see them as parallel issues. Don’t be hostile, defend your thoughts. Hmmm…I don’t know why there is no option for that. Possibly it is because I have my blog set up to only allow X number of replies to one particular comment and we have reached our limit. I haven’t visited those settings in a very long time because it has not been a issue. I am sorry that it gave the appearance that you personally were not allowed to reply. The reason you have been backing up a few posts to make comments totally makes sense now. Thank you for bringing this to my attention. Like I said, I am all for a healthy debate. You have been very good at providing facts to back your opinion up. You are right, I have not provided facts to back mine up to you. It is partially due to time. I am a full-time employee, student AND I and spent 20+ hours a week on my blog…and all of that is in addition getting outside to be physically active. As you can see I have not posted much lately. My time is very limited so my replies to all bog comments are the best I can do with what time I have. It is also partially due to the fact that I don’t think opinions always have to be backed up with fact. People hold beliefs for many reasons that can include learned, personal beliefs and personal observation – all of which are not fact that you can cite somewhere. I am going to be completely honest with you here. I just now realized that we may have had an unforeseen misunderstanding starting way back in August. When I see your comments, I see them from my blog dashboard and they are laid out in a linear fashion. It does not indicate whether your comment was a direct reply or a reply to another comment made. I am just now realizing this. I actually have never received so many comments as a reply to other comments in the past so I did not know that it looked different to me from what appears on the blog post itself. This gave me the impression that you were replying directly to me but I can see now that you were actually replying to comments I had made on other people’s comments. The repetitive nature (that is my perception because of the way I view them on my dashboard) of your comments makes more sense now and they appear less argumentative. Again, this has never been an issue in the past so I apologize for the misunderstanding. Lesson learned on my part. As I have stated several times before, I appreciate that you are passionate enough about this issue that you take the time to comment on my blog. However, my time and energy is very limited. I normally only have the time to make one comment on other people’s comments and move on. I have spent more effort on debating with you than I have this whole past year replying to other comments I think. So please don’t feel that I am “slighting” you – I just only have so much time for the blog and prioritize creating new content for my readers than having a lengthy debate with one reader on one subject that doesn’t appear that there will be a resolution or end to. In any debate, the debaters can choose to agree to disagree and move on. That is the choice I am choosing to make. I do not feel that I have every been hostile to you. If being direct, standing my ground and stating my boundaries came across as being hostile then I am very sorry for that. Given what I just said about my available time and energy, this is my reply to “Tell me why you feel feeding kibble is OK even though you know it can cause harm and tell me if you feel teens should smoke cigarettes even though you know it can cause harm”. I work in the environment and am very aware that there are a million things on this planet that can and do kill you. If you live in a city, breathing pollution in the air can cause cancer; Genetically modified food grown with pesticides can lead to all kinds of health issues; If you drive a car you have a pretty good chance of getting into a car accident at dying, We can’t avoid everything that MAY harm us. However, we would do well to avoid things that ARE harming us right now. Chester and Gretel are examples of health (and Chester is 10!) according to my vet. What we are doing is working (BTW….we feed at least half raw so I don’t think the kibble “risk” is that significant for us). I don’t really know what else to say. My choice is my choice and it is clear that in any further conversation you will expect cold hard facts to back up my opinion and how I feel. I simply do not have the time to do that and, as I said, personal opinions can be formed many ways that do not always include a cite-able link on the internet. Please feel free to continue to comment on my blog. You ARE being heard. However, my responses will be less frequent and more limited from now on. Thanks Jess for the research and sharing G. and C.’s experience. We recently started ordering from wag.com and love the Pro-Treat raw naturals dog treats. Says they have: turkey,blueberries,cranberries, flaxseed, added vits/minerals,no grains, etc. PS) Hope you had a nice time on your honeymoon! Congrats! Hi we have joined and look forward to your next post. Have a fabulous Friday. Hi Molly. Thanks for stopping by to check out our blog! I am headed to BarkWorld but I hope to get a new post up before then and I definitely will after. I must have missed this one, thus the tardy comment. I am looking for an alternative brand of kibble for my three longhair Dachsies. Their skin has become dry and itchy since the cooler weather has moved in and I have been aware of Purina One/ProPlan not getting very high ratings in the food quality field. Therefore, I am open to suggestions on what is working best for your dogs even though ours have always had long and healthy lives on the Purina brands. Any suggestions and help would be greatly appreciated! Thanks for your blog! I enjoy it very much! Love those dachsies!!!! Chester has had an itchy skin issue since he was a puppy. It wasn’t really bad but bad enough that he would get little scabs from scratching and his constant scratching annoyed me. The first food I found that got rid of it was Avoderm. I think that stuff is great, is pretty high quality for traditional kibble and is not real expensive. It is available in most pet stores. I think I used to get ours at Petsmart. I would give that a try before you try anything else and see if it helps. It has avocado extract in it but don’t be scared. Dogs only have issues with the pits and skin…which is not in the food. I have been playing around with Chester and Gretel’s food over the last year in attempts to make them even healthier. Changing foods didn’t seem to negatively affect Chester’s dry skin until recently. I am not sure why but he has been itching more again. Ironically, they have been eating grain free and raw food which is supposed to be healthier. I didn’t see a difference with the grain free but they have been eating raw food over the last few months as at least one of their meals a day. Sometimes I feed raw chicken wings or necks and sometimes I feed prepared, frozen raw. The itching didn’t start again until about a month ago when I started feeding them over 50% raw. If the itching continues I might switch back to Avoderm just to see if he stops itching again. Please feel free to keep us posted or ask any other questions you might have. You can either contact me using the form on the contact page of the blog or connect with us through our Facebook wall. I hope you find something that helps soon. Thank you so much for the feedback! I am going to look for Avoderm in some of our local stores in the St Louis area. I guess it is a good all-around food also, right? I see that Diamond Naturals is one of the highest rated dry foods and I have seen many places that carry it. I thought I could try that also instead of the Purina that I have been feeding them. I will keep you posted and since I already follow your FB page, I will try and keep in contact with you through that and let you know if I have any luck. We dachsies families are a special breed :)! Yes, Avoderm is a good all around food. It is not prescription pet food but does claim to help dogs maintain healthy skin. A lot of dog food claim that but this one actually worked for us. I would be cautious with Diamond dog foods. They have had a lot of recalls and I have to heard very good things about them. It is an individual thing though. What works for some doesn’t work for everyone. Do keep in touch. Good luck. I’m new to the blog, but have very much enjoyed reading all your posts back and forth about food. I have two mini dachshunds (one short haired and one long) and Im having trouble finding a food that works for both of them. Addison (my short-haired) recently started getting UTI’s and extreme constipation. The vet put her on Science Diet c/d until we got the uti’s under control, but wants her back on regular food now but something different then what they were on before. They were eating Blue Buffalo back to basics turkey and potato and doing great on it. Mazie is allergic to wheat and Addison is allergic to Salmon, so finding a food that is compatible with both is a bit difficult. I recently bought the Instinct Rawboost to try with the both of them. They both absolutely love it, but now Mazie is itching incessantly with the only factor change being her food. Does any fellow dachshund people having any food suggestions to try? I don’t care about the cost as long as they are healthy and not itchy! Thanks so much, I really appreciate the suggestions. I Jessica. Chester sometimes has itchy skin too but he doesn’t have any known allergies. I currently feed them Acana. It’s just like Orijen (which is one of the highest quality on the market – one company makes both foods) but not quite as expensive. Avoiding both wheat and salmon can be hard. I feed the Grasslands but it has Salmon meal in it. I would check their line out though. Their Ranchlands doesn’t contain any wheat or Salmon (but does contain flounder, halibut and cod). They also have something called single source for dogs that contains a single source of carbs (not wheat) and meat. For example, here is the ingredient list for their Lamb and Okanogan Apple: Dehydrated lamb (27%), deboned lamb (15%), steel-cut oats, peas, whole apples (10%), whole potato, sunflower oil, oat flakes, lamb liver (3%), sun-cured alfalfa, whole pears, algae meal (source of DHA, EPA), pea fiber, sweet potato, pumpkin, butternut squash, parsnips, carrots, spinach, cranberries, blueberries, kelp, chicory root, juniper berries, angelica root, marigold flowers, sweet fennel, peppermint leaf, lavender, rosemary, plus premium vitamins and minerals. Thanks so much! I will definitely check out Acana and perhaps Avoderm. Which Avoderm do you feed your pups? I was initally worried about it’s low meat content, but my poor girl is itching herself to death and now her poor tummy is all red and her hair is getting matted. I’ve tried everything to bring her comfort and she still itches all night long. Thanks for this great forum, it’s so nice to find doxie owners that can discuss different things related to the breed! I have 2 miniature dachshunds Peanut and Oscar, they are my “kids” and spoiled to the max. I was wondering about the best food to put them on because they are so so picky. I have tried blue buffalo wilderness small breed, royal canin dachshund formula, merrick, earthborn holistic, solid gold small breed formula, and now I am trying the natures valley raw boost food they still seem to be picking at it as well and spitting it back out lol. They seem to like all the different foods for maybe the first 2 or 3 days and then they just pick at it and like I was saying spit a lot of it out. So is a complete raw diet the way to go for my doxies? Hi Krissy. Sorry it took me so long to respond. Your comment kind of got lost in the shuffle. Raw food diets are not for every dog. However, many dogs see significant improvements in their health if they are switched to a raw diet. Many dogs love the taste too. I don’t suggest trying to make your own unless you are willing to consult with a raw food animal nutritionist. It’s just too easy to leave out an important nutrient your pup needs. I would purchase a prepared raw food and see how they like it. It is significantly more expensive than kibble though. 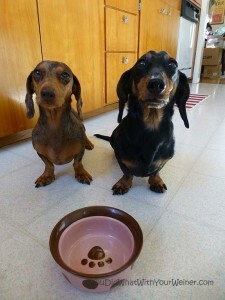 It doesn’t look like you have tried any high-quality, grain-free kibbles for Peanut and Oscar? You may want to try that as an in between step between what you are feeding now and raw. Those foods are usually tastier and have a higher percentage of protein (because they are made with more meat). That way you can see how they do with a high protein diet before you switch to raw food, which is usually 70% or more raw meat. I would suggest trying Orijen or Acana. Those are pretty much the best kibbles you can buy.